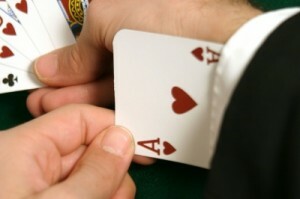 Submitted by Adam, this article belongs to the Poker and Life series. Adam wrote the article below about online poker cheating. Have you experienced online poker cheating? If so we would love to hear from you in the comment section of this article. Cheating in online poker is a very popular conspiracy topic for poker forums and communities. The idea of “cheating” in online poker can create a lot of sub-topics, and it largely depends on what we define as cheating – and who’s doing the cheating in the first place. Poker rooms tend to get a lot of press from disgruntled poker players who receive continuous bad beats or get “sucked out” of massive pots by a set on the river. However, it is extremely unlikely that any poker room particularly the public traded ones like PartyPoker incorporate cheating or rigging the deck into their operational strategy. The negative publicity and legal settlements against them would bankrupt the company and may even force the owners into jail. Hence, the odds are 99% that a poker room doesn’t rig the deck or con their players out of their money. If you’re going to get cheated in online poker, the chances are that it’s going to be from the other players sitting at your table. There are two forms of online poker player cheating that can be used to exploit the system: active cheating and passive cheating. Active cheating works by players working in teams or colluding against the others at the table. They’ll continuously raise the other players out of the pot and basically steal every pot possible losing you big chunks of your poker bankroll. Fortunately, this type of collusion can be caught out by the poker room’s automated software. Passive cheating, where opponents communicate each other holdings to each other (on msn), is much harder to spot, and is your highest chance of being cheated against in online poke. I have witnessed this form of collusion myself in the past, along with one of the player’s getting refunded by the poker room, so I can tell you that it does happen. None the less, it really doesn’t happen that often and there still ways to defend yourself from it with a tighter strategy. In the recent past – specifically on the Cereus Network, security lapses enabled a group of players to cheat by seeing everyone’s opponent’s playing cards. This caused a massive upset in the industry, but it was spotted and remedied literally hours afterwards however. Things like this might happen on odd occasions, but 99% of poker sites employ 128bit encryption and RNG (random-number generators) to ensure hacking is impossible. This is similar to the type of security that modern online banking use. The most common method for cheating in online poker –regardless of whether you consider it cheating or not – is to use live tracking software and a Poker HUD. Together, these tools provide key information and reads about the opponent’s at your table. You can use them to narrow down your opponent’s hand range and get a feel for his playing style. The majority of these tools are accepted at major poker sites such as Full Tilt Poker and PokerStars, however there are a number which are forbidden, specifically those live tracking tools which use a remote database of data as opposed to uploading your own hand history from your desktop. The final method of cheating in online poker is through phishing. Phishing involves using spoof emails and fraudulent websites to trick players into giving them personal information that can be used to hack into their account. You can easily defend yourself against this type of cheating by being smart about who you divulge sensitive information to.